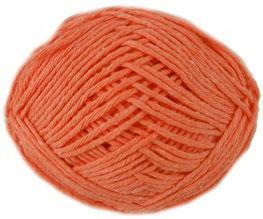 Sirdar Simply Recycled Aran knitting yarn, 39 terracotta. Eco-friendly, soft and lightweight blend of 51% recycled cotton/ 49% acrylic. Knits to a standard aran tension. 50g balls 93m/ 102yds. Stylish and fun to make jacket in 2 lengths in granny square crochet - no shaping, great for those new to crochet. 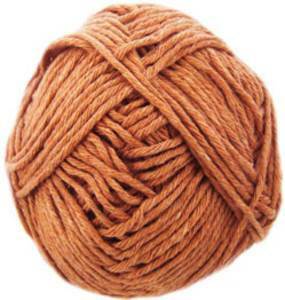 Shown in Sirdar Simply Recycled cotton blend aran, to fit 81-107cm (32-42in). Sweater with round or crew neckline has textured trellis pattern, shown in Sirdar Simply Recycled Aran cotton blend yarn. Includes larger sizes, 81-137cm (32-54in). Beautifully styled cardigan in 2 lengths with cable and bobble panels on rice st background falls in deep V to edge tie. 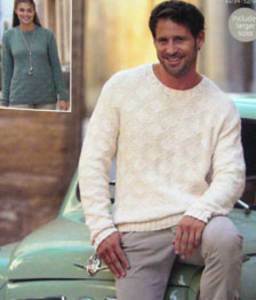 Shown in Sirdar Simply Recycled Aran cotton blend. Includes larger sizes, 81-137cm (32-54in). .
V neck sweater with eyelet diamond pattern and plain sleeves shown in Sirdar Simply Recycled Aran. Includes larger sizes 81-137cm (32-54in). 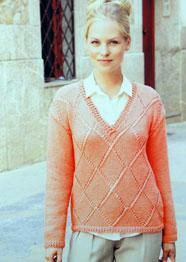 Stunning sweater with flower panel constructed from 11 triangles, shown in Sirdar Recycled Aran. To fit 81-107cm (32-42in).